This device offers a magnification of up to 100 times, with step less adjustment starting from 25 times. 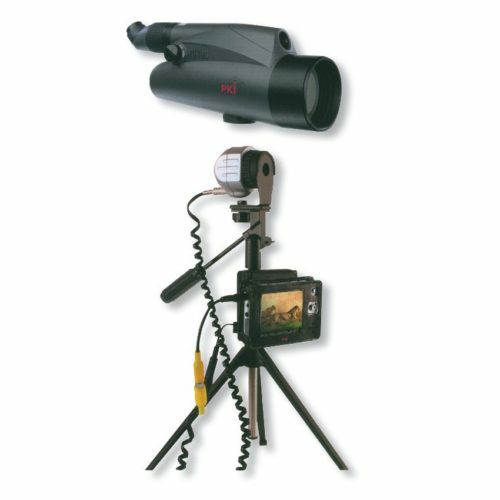 In order to help focusing the correct direction it is equipped with a direction finder, featuring a magnification of 6 to 25 times. By simply turning the button, the magnification range switches to 25 – 100 times. The ocular is mounted at an angle of 45° and is freely rotatable, which allows comfortable handling in all surveillance situations. The digital audio / video recording system realizes excellent recordings at a distance of more than 1000 m. With the PKI 5425 long distances will never be an obstacle any more.